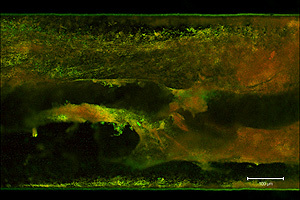 An E. coli biofilm grown in a microfluidic channel of Mariana Meyer's device, stained with fluorescent dyes. A poster presented by Fischell Department of Bioengineering graduate student Mariana Meyer won the Bioengineering division at the university's 2012 Bioscience Research & Technology Review Day. Meyer's poster, "Multi-Depth Microfluidic Biofilm Reactor Fabricated With ALD Passivaton of a Photoresist Mold," described the design of a microfluidic device in which bacterial biofilms—a collection of cells that adhere to each other across a surface—can be studied. The device is capable of separating the film into isolated sections, allowing researchers to simultaneously perform multiple tests on the same sample. Meyer's device uses channels with varying depths to accommodate both the biofilms and the tiny pneumatic valves used to separate them. She developed a new technique to create the different levels by alternating layers of photopatterned polymer with thin layers of aluminum oxide within her device mold. The aluminum oxide protects the polymer layer below as a new one is fabricated above. Her ultimate goal, she says, is to use the device to examine how biofilms respond to new antibacterial treatments being developed in response to the growing number of antibiotic-resistant bacterial infections. "This platform would help streamline the drug evaluation process," she explains. "Its small size means that you do not need large samples of new drugs for evaluating efficacy, and the ability to perform multiple [tests] on one biofilm allows for gathering more information more quickly." Meyer says what she enjoys most about the project is how it requires her to use knowledge and skills from a number of disciplines—including microbiology, electrical engineering, bioengineering, and materials science—to produce an effective device. "I am constantly discovering different aspects to the project and [have] the opportunity to work [on it] with students and experts in a variety of fields," she says. Meyer, who conducts her research at the MEMS Sensors and Actuators Laboratory, is advised by Institute for Systems Research (ISR) director and Department of Electrical and Computer Engineering professor Reza Ghodssi. She is also a member of the Maryland Biochip Collaborative. Her work is funded by the Robert W. Deutsch Foundation, and has been featured in both E@M, the Clark School's alumni magazine, and a Clark School press release. In addition to Ghodssi, her co-authors on the poster are ISR graduate students Young Wook Kim, Hadar Ben-Yoav, and Markus Gnerlich; and BioE Professor and Chair William E. Bentley. Bioscience Research & Technology Review Day is a special event that features research talks, presentations, mini-symposia and demonstrations by university scientists. The program provides a unique opportunity for executives and professionals in industry and government to discover the most recent advances in bioscience and biotechnology at the University of Maryland. The event also promotes new collaborations, networking, and recruitment.